began her career in illustration and design and then found another love in polymer clay. She creates her fanciful creatures made of polymer and paper clay, found objects, wire, glitter, and paint. She looks forward to working in her studio every day and feels fortunate to be able to create her whimsical characters. Her inspiration comes from her love of E.H. Shepard (The Wind in the Willows illustrator), the Brothers Grimm, William Holbrook Beard, vintage toys and wonderful books of her youth. Her many years as a children’s book illustrator has also given her inspiration to grow her characters. She crafts each creature and tile story out of polymer and multiple coats of oil paints, giving them attitude and emotion. Her images have been used for books, magazines, toys, puzzles, posters, greeting cards, Christmas ornaments and textiles, with clients ranging from National Geographic, Unicef and the Smithsonian to HBO, People and Newsweek magazines. She creates her quirky creatures in her Hopewell, New Jersey studio/storefront. 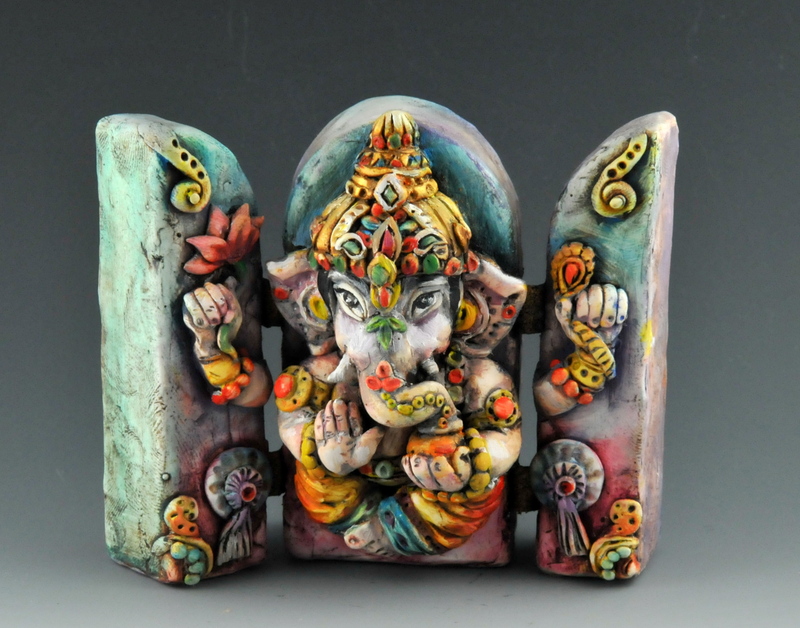 DOREEN GAY-KASSELL – GANESHA TRIPTYCH (Pre-conference) Sat. 16 Feb. Create an iconic object of art out of polymer. In this class we transform a pre-made wooden triptych; we’ll wrap the wood with a thin veneer of polymer and then sculpt the image of Ganesha extending onto the three panels. The sculpting process is broken down into simple steps and she always circulates through the classroom, helping each student individually, so that even if you’re not a sculptor this is a perfectly doable piece! After the image and decorative elements are sculpted and baked, the piece is painted with burnt umber oil paint, which is rubbed off and then colored oil paints are applied and wiped off to achieve a subtle, vintage feel. Ganesh is revered as the Remover of Obstacles and Lord of Beginnings, patron of arts and sciences, and the dIva of intellect and wisdom. In this workshop, you’ll create your favorite avian & or four legged creatures in this workshop. Using simple sculpting techniques you’ll make your own flock of birds, pack of dogs, warren of rabbits, any beast of your choice! Sculpted over glass ornaments with polymer, the technique is full of texture and surface embellishment. After the ornament is sculpted, it’s baked, painted & rubbed with multiple coats of oil paints to achieve a vintage feel. No worries if you don’t consider yourself a sculptor, she’ll break down the process into reasonable steps. Her students have been thrilled with their creations even if they were a little unsure about sculpting. NOTE: This workshop will only be taught once during CFCF 2013.